Spacious apartment with everything we needed. Amazing views across Granada. Olivia booked tickets for Flamenco Show 1 minute walk away. Easy access to amazing restaurants and walking to all activities. Bus stop right outside to take you around the city and to Alhambra. Small shop in the building to get fresh food. Olivia met us at the property which was great as we did not have an exact time for arrival. The location , Albaicin is situated just 10 mins away from the centre. One can take a bus directly to Alhambra. The view point 10 mins walk away offers a magnificent view of Alhambra , Sacramento and Generalife. The apartment is very beautiful and super clean. One room is with twin bed and one with double bed, proper kitchen and dining space. Tastefully decorated. Olivia and Javier were great. They communicated clearly and were sympathetic when we arrived late. Very clean and comfortable, excellent views from balcony. Quiet location. Best apartment rented ever! Breathtaking views, comfortable mattress, fully equipped kitchen, spacious living room! The host recommended a trail which highlighted our day! Perfect location! This is a modern, well furnished and spacious apartment with a fantastic view of the city. The apartment has everything we needed with good bathroom facilities and a comfortable lounge area. The location was ideal as a base for exploring the city and the host was very friendly and helpful. The apartment is away from any busy roads so was very peaceful. The balcony offered amazing views and a good place to eat and drink in the sunshine. 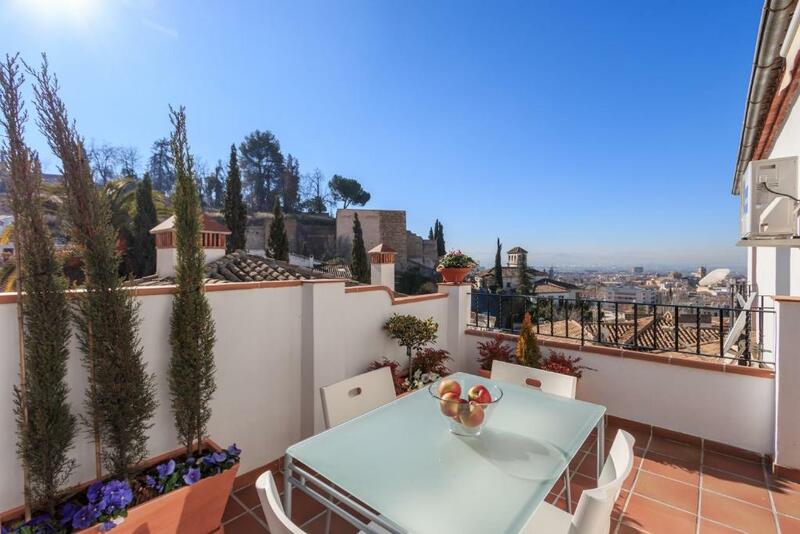 Excellent location in the heart of the old town of Granada. Lovely terrace with views overlooking the town. Friendly arrival procedures with good directions and met on arrival. Facilities in the apartment were great with a washing machine, cooker and fridge. There is a bus stop opposite the apartment that does a loop around Granada centre and through the old town - if you buy a Granada card you get free bus tickets included. Great location, spacious, very clean and chic. There is a fantastic view of Granada from the roomy balcony. Lock in a great price for Albaicin Luxury Apartments – rated 9.3 by recent guests! Located in Granada, near Granada Cathedral and San Juan de Dios Museum, Albaicin Luxury Apartments features free WiFi. Some units also have a kitchen equipped with a dishwasher and oven. The apartment has a sun terrace. Basilica de San Juan de Dios is 1.1 miles from Albaicin Luxury Apartments. The nearest airport is Federico Garcia Lorca Granada-Jaen Airport, 14 miles from the property. This is our guests' favorite part of Granada, according to independent reviews. 뀐 Located in the top-rated area in Granada, this property has an excellent location score of 9.0! When would you like to stay at Albaicin Luxury Apartments? This heated and air-conditioned apartment has 1 double bedroom and 1 twin bedroom. The open-plan kitchen is equipped with a microwave, coffee machine and toaster, while the living area comes with a flat-screen TV and sofa. New and beautiful apartment with views of the Dar al-Horra Palace, one of the main monuments to visit in Granada. 5 minutes walk from Calle Elvira and Gran Vía where there are bars and restaurants. 10 minutes from Plaza Isabel la Católica, Cathedral and Plaza Nueva, 7 minutes walk from the viewpoint of San Nicolás. It is ideal for couples, business travelers, families and / or groups of friends. This beautiful and modern brand new apartment is located in one of the most beautiful and unique places of the city of Granada, in the mythical and unique neighborhood of Albaicín, surrounded by numerous monuments and a safe environment. With a careful and exquisite decoration, you can enjoy its magnificent terrace overlooking the city and the Dar-alHorra Palace. The sunny and bright living room has a kitchenette and access to the terrace. It has 2 bedrooms, carefully decorated, one with double bed and one with two single beds. Regarding the surroundings, it is not surprising that UNESCO declared the World Heritage of Humanity in 1994, since its narrow streets and typical houses have unparalleled beauty and charm. House Rules Albaicin Luxury Apartments takes special requests – add in the next step! Please inform Albaicin Luxury Apartments of your expected arrival time in advance. You can use the Special Requests box when booking, or contact the property directly using the contact details in your confirmation. One of the most picturesque neighborhoods in Granada! The street and parking access was very difficult and like most older cities finding the actual entry to apartment a bit difficult but Olivia met us there and assisted with everything. Wonderful view on city, fantastic place ! Beautiful interior and good location! The kitchen was not as well-equipped as it could have been. A toaster and a few more pots and pans would be good, but then you’re in Granada, and the tapas is too good to stay in and cook most nights. The bed was comfortable but was prone to sliding away from the wall when sitting up in it. Its great having parking under the apartment but do not hire a large car as it is a very tight parking space in the underground car park. Parking was a tight squeeze but it was fortunate to have a spot in a garage in this part of the old town. Great location , great ppl. , private car parking,full kitchen equipment,clean sheets, amazing city. Every thing was incredible . Javier is honest host . I had some problem during my stay he was more than helpful. If I had the chance to visit Granada agin , definitely I will book this apartment again.